easescreen is the flexible digital signage software that provides digital communications to companies in the form of displays, LED / video walls, digital doorplates, waiting time management systems or tablets in a variety of industries. New trends require new possibilities. Companies and industries are changing as a result of digitization, the touchpoint is becoming dynamic and the customer is being asked to interact. Users interact with the displays as they are used to doing from their smartphones. whether infotainment, as an interaction system or automated advertising space with interface connection. enable exceptional installations and score points with manageable effort, stable operation and extremely easy operation. Our software forms the flexible basis for a wide range of applications in the digital signage sector. offers the greatest possible flexibility and enables tailor-made solutions for all areas of use, from stand-alone solutions to systems for complex branch chains. In addition, hyper-localization enables the distribution of content at the right time, in the right place – and in real time..
Make the most of digital signage potential! 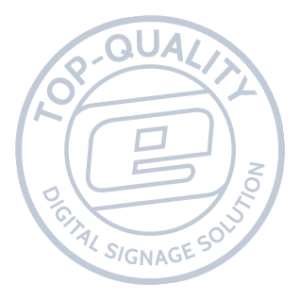 easescreen makes digital communication easier and more effective than ever before. Out of the box or customized: easescreen is scalable and configurable for all projects and offers powerful options..
would like to develop and expand new markets with certified partners. the joint generation of opportunities and projects in a long-term cooperation. From the simplest single solution to the enterprise solution, everything can be tailored to your needs with easescreen. To develop a reliable, profitable sales concept, contact us . from our certification program with extensive trainings!